John S. Lord was born in Orlando and currently lives in Winter Park, Florida. Mr. Lord was elected as a Trustee of the Alfred I. duPont Testamentary Trust in July 2000 and became a member of the Board of Directors of The Nemours Foundation the same year. He served as Chairman of the Board of Directors of Nemours from February 2007 to August 2015 before stepping off the Board in late 2016. 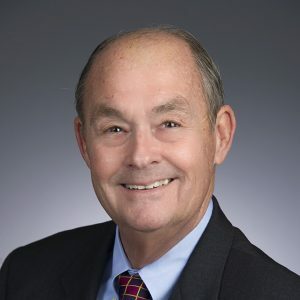 Mr. Lord retired in 2000 from his position with Bank of America as the Orlando-area market President and Small Business/Premier Banking Executive for the State of Florida after a 32 year banking career to join the Trust. Mr. Lord currently serves as a board member for Dornoch Sutherland Assurance Ltd., Cruden Bay Risk Retention Group and the Pediatric Medical Services of Florida Inc. Mr. Lord is former director of the St. Joe Company, Florida East Coast Industries and ABC Fine Wine and Spirits. Mr. Lord is a former chairman of the Orange County Industrial Authority, the Mid-Florida Industrial Development Commission, the Community Foundation of Central Florida, and the Florida Citrus Sports Association. He has served as treasurer of the Orange County Public School Foundation, vice president of the Orange County Civic Improvement Corporation, and the 1999 chairman of the Heart of Florida United Way. Mr. Lord also is a former appointee to the Valencia Community College Board of Trustees, where he served as chairman in 1994-95. He served as an Overseer of Rollins College Crummer School of Business for 16 years and serves as a member of the Board of Trustees at the University of Central Florida. He is married to Carolyn and has two children and two grandchildren. He and his wife enjoy travel and remain active in the Central Florida community.